The Owls will have a short preparation period before heading west to take on North Texas. 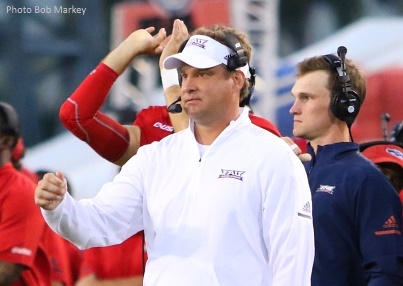 Looking towards that contest, Florida Atlantic Head Coach Lane Kiffin met with members of the media on Sunday. Below are the highlights of his session. It seemed like with North Texas last year that you guys had the advantage because Jason (Driskel) could throw downfield. Is there more of a need to get Chris (Robison) and those deep passing plays going again? Yeah, we would like to hit the deep passing plays. That is pretty obvious. What always happens at some point they stop your run and load-up. You have to hit them, we were able to hit one in the second half (versus WKU). We hit one in the first half too. But, yes those are important. When the year started, it seemed like Chris was having his best success when Pico (Tavaris Harrison) was kinda that second outside guy with Jovon (Durante). Was it good to see Pico kinda respond last night, get back into the rotation and have a nice night? Yeah, you are really taking the obvious questions away from your partner there. Yes, it was good for Pico to make some plays. That was good. Why do you think Pico kinda disappeared for a while and what did he do to get back into the game? He was hurt. He was either out or limited the last couple of weeks. It was not a production issue, it was injury. How much did the FIU win a couple of weeks ago let the team know, even though it was nearby, that the team could win on the road and how much does that help going into this week? Well, this is obviously a difficult game against a good team. It will be 9:30 p.m. our time on Thursday night on the road in some really cold weather, so a lot of challenges there, which were different from the FIU game. This setup is a very difficult task. What do you do differently to prepare for cold weather games? Nothing, unless you have a way to make it cold here. There is nothing you can do. Chris (Robison) told us he didn't know that he was starting up until kickoff. Can you kinda take us through what the process is, when the starting quarterback is up in the air and how you communicate it to those guys? We tell them to always be ready to play. Everyone, regardless of your position, should prepare like the starter. We were going through different options. About the best option was to repeat the week before which worked was Chris starting and De'Andre (Johnson) coming off the bench and playing well. We went with the same format. When you look at the tape on Mason Fine this year compared to last year, is there any difference? Has he gotten better at anything? Taking care of the ball. He went 300 passes between interceptions and he had only thrown one interception. He threw one yesterday for the second of the year, so that is pretty remarkable. Coach is it reasonable to think that the quarterback rotation in some form is going to play out this week and the rest of the season? Play out? As far as? Are we probably going to see both guys in the game this week against North Texas and then again versus Charlotte? We just take one week at a time. Like I said about following the format from the week before you know what would work. After watching the tape, the bad thing obviously was the turnovers. Two turnovers, both getting hit from behind. Dre (De'Andre Johnson) has another one that they almost get when they strip the ball from him in the pocket. Those obviously were discouraging, to put the ball on the ground like that. Coach we are seeing more of KiKi (Akeleis Leroy) at linebacker? What is standing out to you about Akeleis' play? He is very physical, plays downhill. Plays aggressively. Very, very pleased with his production as a young player. Coach it sounded like there was a but to the end of your De'Andre Johnson statement there about being discouraged with the ball being on the ground. Was there something you wanted to add there? You guys asked about the quarterback play. But, the quarterbacks I thought outside of the turnover part did well. Their numbers played out very well outside of no touchdowns and interceptions. But, 20-of-25 for 260 yards is pretty productive. Coach what does this team need to do in regards to red zone defense? I think in the last game, on defense in general, (we) did really good on about 90 percent of the snaps. Outside of the long run, we stopped the run most of the day. They threw three more interceptions to us that we thought we could have made that would have made the day very different. We just have to capitalize on those opportunities. What do you take away from the two games that you have already played that are non-Saturday games and can you apply them to a Thursday game? Like I said, there are obstacles here. A Thursday game is always an obstacle for the road team, but especially when you put the time at 9:30 p.m. We are supposed to get back here at 6 a.m., I think, on Friday on a school day. I don't know how this is in the best interest of the student-athlete at all. It is what it is. Are Thursday games significantly more difficult to prepare for than a Friday? There has always been an issue with people not wanting to play Thursday road games. Just look at the numbers over the years. The percentages, how they play out, or some big upsets like you see over the course of years. It was what (happened with) Clemson, I think last year. I think that is always something people are nervous about. What is the most difficult part? I guess you have to scale back practices. Where do you skip? What do you cut back or do you just do it evenly across the board? No. Tomorrow (Monday) is basically the only practice day. We try to do everything, which is difficult. You have to get it all ready. We did play these guys twice last year so that helps a little bit. It helps both sides, not like it just helps us. There is some familiarity there. We practice tomorrow (Monday) and then all of a sudden next day is already our walkthrough day. With the Thursday night games, obviously with the NFL people have said that there is a problem there because of the short rest. Is that something you would like to see scaled back or even eliminated? Yeah, we want no part of Thursday night road games, but we don't have a choice, They put it out. There is a certain amount that the conference gets to choose and how they want to put them and we don't have any say in it. It is what it is. That is why you see a lot of major teams don't go play Thursday games any more, especially on the road. Coach have you talked to your guys that you have to win one of these last two games to be bowl-eligible, about claiming that this week and not leaving it up to chance? Do you talk bowl eligibility now more than ever? No. I didn't mention it today to them. I think they know what it is. I have said it before. If that is your motivation it is what it is, make sure you win the six games. I don't really think that way as you know. Did you catch a break with North Texas losing this week or do you expect an angry team? Are they going to be down or angry? How do you approach that? How do you look at that? I don't. It works both ways sometimes. Sometimes you lose and it re-motivates you. So, you come back and play really good afterwards. Sometimes there is a letdown because you are disappointed, a game that I'm sure they feel they should have won, up 28-nothing I think. Whatever, it could be either way. Often times you see a team that had a bye the week before (the Thursday game). Do you think that is generally how it should be done? How the conference should schedule these type of deals for a Thursday night game if a team is forced to play on the road on one? Yeah definitely, like I said, that is why there are some major conferences or teams that don't do it because they know the issues that lie with it and all of a sudden you lose to a team in one of those conferences you think you probably would have normally beaten on Saturday but you put them on the road on a Thursday. They lose the game and knock them out of the playoffs, or something like that. That is why people steered away from this. Coach, is Reggie Bain healthy? Was it just a tough opponent he was going against last week? (Reggie) had two rough snaps there for sure, on the sack-caused fumble and one leads to an interception. I'm sure he wants to play better. What is something on the defense that has been overlooked as a reason why that side of the ball has been playing well the last few weeks? I think part of that is that statistically you have to look at the non-conference schedule is very difficult on your defense. Whoever put this together years ago to play a triple option team and then also you play two offenses that are two of the top four offenses in the country, in UCF and Oklahoma. That is going to kinda set your stats back early, especially when you don't play well against those guys. Now you are seeing some offenses here as of late that aren't quite as powerful. They (UCF and Oklahoma) are the No. 1 and No. 3 offenses (in the country). Shelton Lewis mentioned that they got better reads on the quarterback on Saturday because they were playing a little more zone defense. Is that something that you are encouraging or is that something that seemed like a fit against Western Kentucky? It all has got to do with the opponent you are playing and your matchups. The different type of routes that they run. What is the down and distance? You play a lot more man on 3rd-and-lower mediums. You can't play zones because of too many completions. Last night, I think we had 12 3rd-and-7 pluses. That is part of that.